Test your knowledge of English phrasal verbs with this 20-question quiz! Choose the best answers to complete each phrasal verb, then click the blue “Get results” button at the end of the quiz to see the correct answers and explanations. 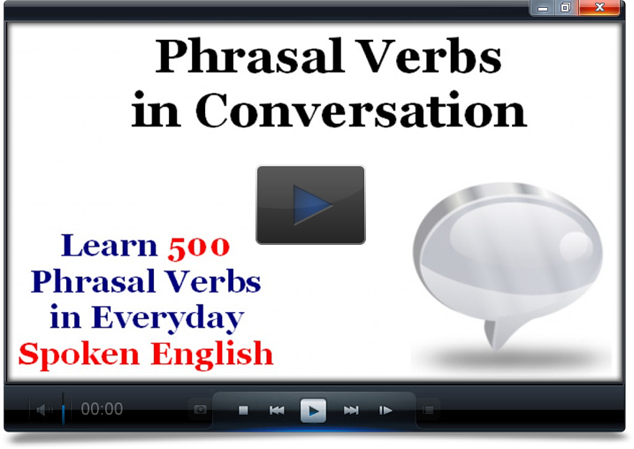 To learn 500+ phrasal verbs in context, check out the Phrasal Verbs in Conversation Course. Choose the correct preposition to complete each phrasal verb. Hang __________ a second - don't make a decision before you know all the facts. Both "hang on" and "hold on" mean "wait"
I hadn't seen him in several years, so it was nice to catch __________ over lunch. To "catch up with" someone can mean to exchange news about your lives after not having seen the person for a while. It's really a small problem - you shouldn't make it ___________ to be worse than it is. To "make something out to be (something else)" means to describe or portray it as different than it really is. The salesman talked me ___________ buying the best model. To "talk someone into" doing something means to convince them to do it. The opposite is to "talk someone out of" doing something, meaning to convince them NOT to do it. Our plans for a weekend trip fell ____________ because my husband had to work overtime. If a project or plan "falls through," it means it fails and is not successful or not implemented. My neighbor dropped __________ yesterday afternoon for a cup of tea. To "stop by" or "drop by" means to go for a quick, informal visit. I was blown ____________ by the sheer size of the mountains. If you are "blown away" by something, it means you are extremely amazed or impressed. The exceptions to the rules in English always throw me ___________. If something "throws you off," it means it confuses you and leads you in a wrong direction. It makes me uncomfortable when someone I've just met starts hitting ____________ me. To "hit on" someone means to flirt with them, to clearly demonstrate romantic/sexual interest in them. Your mom's gonna be mad when she finds ___________ you broke the window. The phrasal verb "find out" means to discover or learn some new knowledge. The baseball game was called ____________ because of the rain. To "call off" an event means to cancel it. Whenever I'm sad, playing with my dog always cheers me ___________. The phrasal verb "cheer up" means to make someone who is sad happier. I missed yesterday's episode, can you fill me ____________ on what happened? To "fill someone in" on something means to give them information/updates that they previously missed. Lots of people fail at starting a business, but my cousin pulled it ___________. If you "pull something off" it means you succeed at that thing (especially something that is difficult/challenging). All the students pitched __________ to clean up the classroom. To "pitch in" means to contribute help to a group effort. He was kicked ___________ of college for cheating on a test. If someone is "kicked out," it means they are forced to leave a group, school, or house. If someone's making unreasonable demands, you shouldn't give ___________. To "give in" means to yield or submit to something. I hope I don't slip _________ when giving my speech! To "slip up" means to make a mistake. It's annoying when people promise to do something, but later back _____________. To "back out" means NOT to do something you previously committed to. We came ____________ some old photographs while cleaning our parents' attic. To "come across" something means to find it unexpectedly.